The Little House of Concrete Music: Chuck Leavell "Back To the Woods: A Tribute To the Pioneers of Blues Piano"
Chuck Leavell "Back To the Woods: A Tribute To the Pioneers of Blues Piano"
Start talking blues and the first instrumentalists that come to mind will, more than likely, be guitarists, probably electric players, and when you cast your gaze further back it’s easy to be distracted by the portability of the acoustic guitar in the hands of wanderers like the legendary Robert Johnson. We forget, rather conveniently, that there’s a considerable tradition when it comes to the blues piano. That comes down, I guess, to the dominance of the electric guitar, hardly surprising when you place the axe in the hands of Muddy Waters or B.B. King, Eric Clapton or, say, Duane Allman. The Allman reference is particularly apposite in this case since it was the post-Duane Allman Brothers Band that first shot Chuck Leavell into prominence. You don’t do a like for like swap when you’re looking to replace someone like the late great Duane, and rather than aiming to continue the Allmans’ twin lead configuration, 1973‘s Brothers and Sisters saw the lead roles shared between Dickey Betts’ guitar and Leavell’s keyboards. From there (for those unfamiliar with a man who’s seemingly been happy to play a side man’s role for the past couple of decades, Leavell went on to an Allman’s spinoff outfit (Sea Level, which started out playing the opening set at Allmans shows) and joined the Rolling Stones touring outfit in 1982 as the second keyboard player, moving to the forefront after Ian Stewart’s death and ending up as the Stones’ musical director. Along the way he’s also worked with Eric Clapton, George Harrison, Gov't Mule and The Black Crowes, recording three solo albums on top of a fairly active gig schedule. He’s also a noted conservationist and tree farmer. 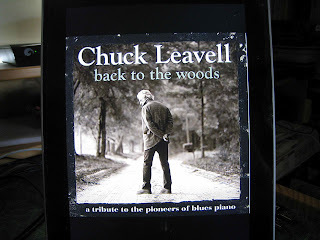 Back to the Woods: A Tribute to the Pioneers of Blues Piano came about as the result of a suggestion from Leavell’s son-in-law, an academic specialising in American history, the visual arts and roots music, who noted that while there have been a number of tributes to blues guitarists, songwriters and singers and significant figures in the world of jazz, no one had come up with a tribute to the pioneers of blues piano. He handed over three CDs of archival recordings, around a hundred and fifty tracks in all and Leavell went about narrowing down the selections, first to fifty and finally to the fifteen tracks presented here, covering the likes of Leroy Carr, Skip James, Little Brother Montgomery, Otis Spann, Memphis Slim and Ray Charles, names that will be familiar to blues scholars but would probably fail to register on the average fan’s radar. Except, of course, for Ray Charles, but Losing Hand dates back to 1953, well before his commercial heyday, and apart from Otis Spann’s Boots and Shoes most of the remaining material dates back to the days before World War Two and the dominance of the electric guitar. With basic tracks cut in Studio 1093 in Athens, Georgia, with a core band of Leavell (piano, organ & vocals), Chris Enghauser (acoustic bass) and Louis Romonos (drums) and overdubs and extras added at Electric Lady Studios in New York and Muscadine Studios in Macon the album features an impressive lineup of guests fleshing out the basics as Leavell sets out to interpret them in a more modern setting, more modern arrangements…but keeping the essence of the songs intact. Those guests include Keith Richards and John Mayer on guitar, sax from Randall Bramblett (sax), Danny Barnes on banjo, guitar and tuba along with vocal contributions from Col. Bruce Hampton and Candi Staton. Leavell had been after Susan Tedeschi or Grace Potter to provide the female foil, but Candi Staton lived close by and had a background in R&B and gospel rather than the disco material associated with her name Down Under (if, that is, the name registers anything other than vague recognition). As far as the music goes, we’re solidly in Leroy Carr territory (Evening Train, Low Down Dirty Dog, Naptown Blues with a Danny Barnes vocal, Mean Mistreater, a Candi Staton Leavell vocal duet, Memphis Town with Danny Barnes as the vocal foil for Leavell). The set opens and closes with covers of Little Brother Montgomery material, No Special Rider kicking off proceedings by showcasing Leavell's skills on the ivories and Vicksburg Blues winding things up with a piano and vocal solo. In between, apart from the Leroy Carr, there’s Memphis Slim’s Wish Me Well, Otis Spann’s Boots and Shoes (guitar work from Keith Richards and John Mayer), Ray Charles’ Losing Hand and a couple of more obscure names in Charlie Spand (Back To The Woods, Keith Richards on guitar), Barrelhouse Buck McFarland (I Got to Go Blues, Col. Bruce Hampton vocal). Southern Casey Jones rocks along merrily, Skip James might be more often thought of as a guitarist, but If You Haven’t Any Hay has a solid keyboard riff and a fair degree of the old nudge nudge innuendo and the Candi Staton vocal on the penultimate The Blues Is All Wrong is one of the album’s highlights. At $16.99 on iTunes for just under an hour’s music, there are far worse places to start investigating the blues piano tradition, but, given the benefit of hindsight I should have shelled out the extra $2 for the version that includes the digital version of the sixteen-page booklet with song annotations by Leavell and an essay by blues historian Larry Cohn outlining the backgrounds of the original artists, and the role of the piano in the evolution of the blues.